Toronto ON (November 19, 2011)- The Egyptian Canadians for Democracy (ECD), an aspiring, not-for-profit organization, will be organizing a protest against Military Tribunals for Civilians in Egypt. The protest will take place this Saturday, November 19, from 11 a.m. to 3 p.m. at Dundas Square, Toronto. The event is a part of the worldwide movement “No Military Trials”, and the protest is one of a series of worldwide protests, which have already taken place in London, Budapest, New York, Düsseldorf, Paris, Frankfurt, and Montreal. Military tribunals for civilians are serious transgressions of human rights, and violate international law. According to the United Nations, “…article 14 of the International Covenant on Civil and Political Rights (ICCPR), which affirms that everyone has the right to be tried by a competent, independent, and impartial tribunal”. Military courts differ from civil courts in the sense that one is led by judges and the other is run by military personnel; civil courts allow the right to appeals, while military courts don’t. Meanwhile, if one was to appeal to the court of Cassation, another form of appeal enjoyed in civil courts, in military courts, it is made up of officers. In military courts, one does not have the right to defense, or the court itself may appoint a lawyer or an officer on one’s behalf, without one’s permission. One does not enjoy the right to demand witnesses or one’s own lawyer. Military courts may try an individual without having to refer to official medical records, in contrast with civil court, which is required by law to refer to official or professional medical records and witnesses. Meanwhile, the trials themselves, the investigations, and the prisons in which civilians serve after being tried are suspects of crimes against humanity and human rights (including torture, sexual harassment, deprivation, etc.). “We are appalled by the actions of the Supreme Council of Armed Forces (SCAF) of Egypt following their acquisition of power. The Egyptian people have come out, giving up their economic stability and individual security, risking everything they had for freedom, human rights and social justice. Yet nine months later, more than 12,000 civilians are being tried in military courts, and imprisoned in military prisons for practicing their right to speak out against the system, and for criticizing the actions of a corrupt government. The SCAF had acquired their current position on the basis that they will carry the revolution, protecting it, its goals and its people. They are at this stage failing to maintain the revolution, solemnly destroying it, failing to protect the nation, and committing illegal and unjust acts of aggression against the people of Egypt. 5) Reforming the Police Forces and taking responsibility of restoring order and security in Egyptian cities and towns. An online political group -soon will be registered- as a Non-profit Organization, concerned with reaching out to the Egyptian community in Canada and democracy loving Canadians to form an undisputed force of change to positively influence the transition to democracy in Egypt. 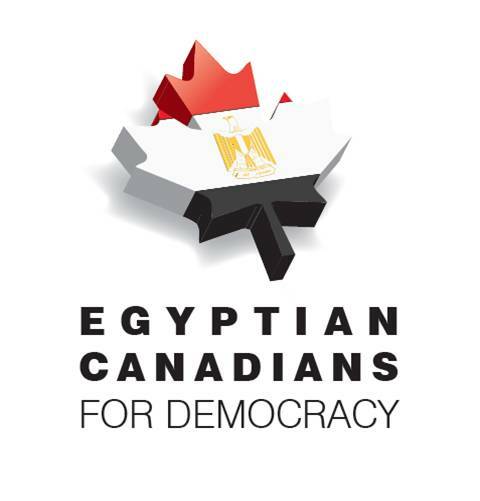 It is also a starting point for an active front that serves the Egyptian community in Canada and bridges the gaps between Egypt and Canada, both people and governments. The idea of the group came as a repercussion of recent events taking place in Egypt since the January 25th revolution. It has a political dimension, as well as cultural and social. Yet for the mean time it is more focused on the political dimension and the need to bring to life the role of Egyptians living in Canada in shaping the future of the state that is being born in Egypt following the fall of Hosni Mubarak regime. The group is created by volunteers who are advocates for democracy and human rights. The group is inspired by the positive values of democracy and tolerance that are enjoyed and practiced here in Canada and aspires for all the Egyptians living in Egypt to enjoy it as well. It is meant to include the full spectra of the Egyptian community in Canada, regardless of their faith or political affiliations.